Theresa Lillian (Hyzak) Mazoch passed away peacefully in her home on October 27, 2018, just two days shy of her 96th birthday. She was the second youngest of ten children born to John Hyzak and Marie Hroudny on October 29, 1922. Theresa grew up on the family farm in Granger, Texas. Her childhood was a happy one as all her brothers and sisters were the best playmates. She married her sweetheart, Edwin Mazoch in June of 1947. They were married 35 years until his passing in October of 1982. Theresa was proud of her Czechoslovakian roots and learned how to bake from her mother at an early age. She was an expert cook, baker, jelly maker, seamstress, and gardener. Her kolaches, strudels, candy, cakes, and Czech Christmas pastries were legendary. She was highlighted by the Corpus Christi Caller Times with a story, picture, and recipe spread. She was also honored in Southern Living Magazine with a carrot recipe she had been making for years. Theresa also had a catering business for several years and perfected her punch recipe which she had kept a secret for a long time. She and Edwin complimented each other as he was very artistic and they created wonderful wedding cakes for family and friends. Theresa would bake and decorate and Edwin would complete the script that was needed. When kolaches were made in the summertime, the air conditioning was turned off in order to have them rise correctly. Samples were always encouraged! Theresa cooked and baked without measuring, and when asked how much ingredient was needed, she would say just enough until it all comes together. She and Edwin made their own Christmas ornaments, decorations, stockings, and afghans. Christmas was a very special time in the Mazoch household and Theresa loved decorating the house and cooking for family and friends. It was a home away from home for many priests who would enjoy Sunday dinner and watch football in the afternoon. There was always room at the Mazoch table for another guest. Her sisters talked her into making a trip to Prague and Damborice, Czech Republic, which was a highlight of her life. They enrolled in a summer university course, visited her cousins and were able to see the home where her mother grew up and the church she had attended when she was a little girl. Theresa enjoyed being a member of the Altar Society, both at St. Cryil and Methodius Church and Most Precious Blood Catholic Church. She was an active member in KJT, ran the kitchen at Most Precious Blood BBQ’s, and was a Eucharistic Minister at Most Precious Blood Church. Theresa had a love of service to others and passed this love along to her children by setting examples for them to follow. She is preceded in death by her parents, nine brothers and sisters and her husband of 35 years, Edwin. Theresa and Ed leave behind three children whom they loved very much. Kenneth Mazoch of Corpus Christi, Texas, James Mazoch (married to Rodlyn) of Corpus Christi, Texas, and Katheryn Mazoch Henson (married to Rick) of League City, Texas. 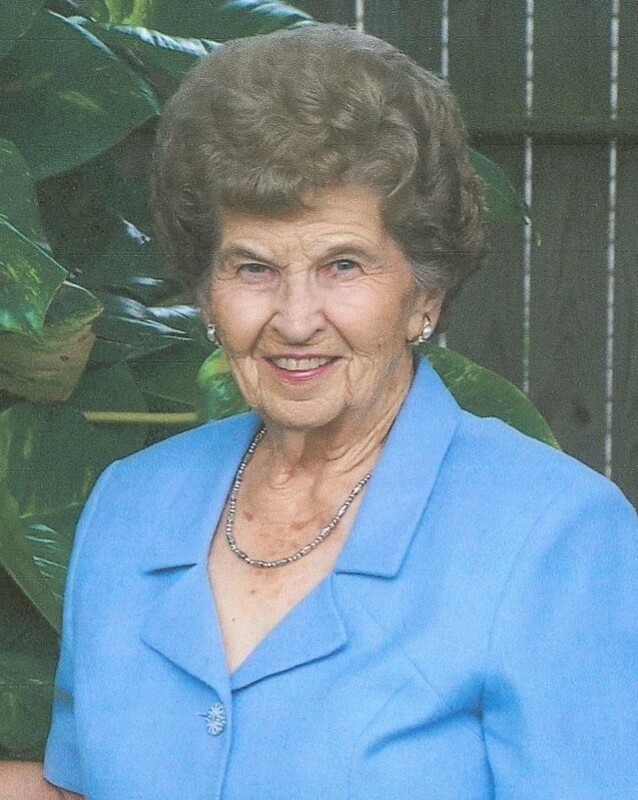 She also leaves behind four grandchildren: Nick and Travis McNamara of Houston, Texas, Clare McNamara of New Braunfels, Texas, Daniel Mazoch of Corpus Christi, Texas, her sister-in-law, Alice Mazoch, of Granger, Texas, and many nieces and nephews. She was extremely proud of her grandchildren as she watched them grow up and accomplish their lives. James and Katheryn especially would like to thank their brother, Kenneth, for the devoted care he provided to mom, especially during the difficult, last several years of her life. Theresa’s family would also like to bestow their heartfelt thanks to Dr. Andres Bonelli, all the nurses, aides, and therapists with Nurses On Wheels that have showed her loving care and kindness. Theresa was an inspiration to her children and grandchildren. She will be missed by all who knew her. She will be there to greet us with a smile and a hug when we see her again in Heaven. Chapel, with a Rosary to be recited at 7 p.m. A Funeral Service will be held at 10:00 a.m. on Friday, November 2, 2018, at Most Precious Blood Catholic Church St. Jude Chapel. Interment to follow at Seaside Memorial Park. A reception will be held at Most Precious Blood Church directly after the burial.